Several years ago I installed the K&N FIPK air filter kit for the Mitsubishi GT3000 in my Montero Sport and I've been very happy with it since. 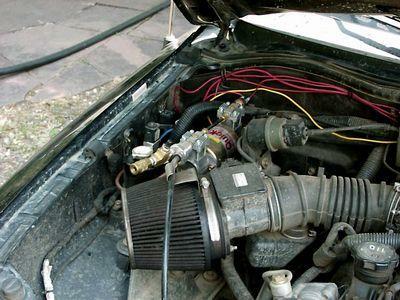 The performance improvement, especially when combined with the CAT-back modification, was significant and being able to clean the filter rather then buy a new one every six months has been a real money saver. on his Montero Sport and was very happy with the boost in torque. After riding in his Sport I was pretty impressed, too. I was surprised to see that much of an improvement in low to mid-range torque. Unfortunately, the $170+ price was a bit hard to swallow. Especially since my K&N FIPK kit had already cost me close to $170. Nor did I really need the entire kit. I already had the filter and adapter plate that attaches the filter to the mass airflow sensor. I still believe the K&N design of the plate is better then Ingen's so I wasn't in a hurry to pitch everything and start over from scratch. Earlier in the year I'd found some companies do sell just the air intake tube, but none listed anything for Mitsubishi Monteros or Montero Sports. And most wanted pre-payed orders and wouldn't supply any dimensions before ordering. I've found more then a few companies like this recently and I'm not too happy about what appears to be a trend in business. But, that's a topic for a different article. :-) Anyway, after draging my feet for about a year, I chanced to stop at a local Checkers Auto Parts store and speak with one of their sales people. 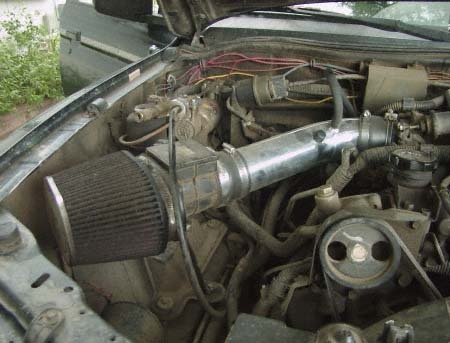 He explained how he'd mounted the intake tube on his car using rubber pipe sleeves from a hardware store, some attempts at using other materials and such. He then showed me the intake tube from a Honda Civic so I got a close look at the real thing vs. bad pictures in a magazine. I also got to take some measurements. It appeared that the intake tube from the Honda Civic kit would work. The diameter of the tube was good and the placement of the single bend in the tube was in the right spot, but none of the brackets, clamps or sleeves appeared like they'd fit a Mitsubishi. So, I kept pursuing a kit specifically for the Sport. He found one - $170 and two and a half weeks for delivery. Sigh. Too rich for my blood so I figured I'd look around a bit more. On the way back I stopped at another auto parts store for some stuff I'd forgotten and just for the hell of it decided to look at their import speed parts. Ha! What should I find but the same Honda Civic air intake tube kit that the first shop had sitting on the shelf for, you guessed it, $170. ARG!!! Then as I turned to leave I spotted a plastic wrapped air intake tube! JUST the tube kit. No filter and no sleeve to attach to a mass air flow sensor but it did have a bracket, PCV hose, and the reducer sleeve to mount the tube to the throttle body. For, of all things, a Honda Civic/Acura Integra. The kit is from Spectre, part number 8219, and is specfically for the 92-00 Honda Civic and 94-00 Acura Integra. Also, right next to the intake tube they had a 3" to 3" replacement sleeve - also from Spectre - that would mount the mass airflow sensor on the Sport to the intake tube. Grand total of $39 for the tube, plus $4 for the 3" sleeve. Very cool! The only thing I thought I needed was another 3" sleeve which, of course, they didn't have, so a quick trip to a hardware store supplied me with a 3"-3" PVC rubber pipe sleeve and two hose clamps. First off, I knew the bracket wouldn't work. The included 'bracket' is worthless - but what do you expect for $39. Cheep, thin strap aluminum but I still had the heavy steel brace from the K&N so that didn't worry me too much. The fitting on the intake tube for the PCV hose from the valve cover points towards the front of the engine rather then the back like the stock fitting, but they give you a 1' long piece of hose. Again, not a big deal as I figured I'd just splice the original hose and the new one together and then plug it in. Ok. Still good. The bend in the intake tube next to the throttle body was close enough to perfect to have been made for the Mitsubishi, so no problem there either. Length. Hmmmm. That was the only issue I was concerned with. So, I took everything home and got started about 7:30PM. Remove the K&N air filter. Unplug the mass airflow sensor. Remove the mass airflow sensor assembly from the stock intake hose and measure the diameter of the sensor where the stock hose clamps. A little larger then 3" but not much. Perfect. Stick new 3"-3" rubber sleeve on top of still hot engine cover while I finish taking the stock rubber intake hose off the throttle body. Take a GOOD look at the stock intake hose throttle body end. Hmmmm. You know, this looks smaller then 3", I wonder.... Take new Honda Civic rubber throttle body sleeve off of new intake tube and slip it on the Mitsubishi throttle body. Whadayaknow!!!! Dang thing fits perfectly! Note to self: return rubber PVC pipe sleeve to hardware store. Ok, so far this rocks! EVERYTHING from the Honda kit fits so far. Last thing to test. Take mass airflow sensor assembly and warmed up, flexible 3"-3" intake tube sleeve and see if it works. The inside of the sleeve is almost exactly 3" ID and the mass air flow sensor is about 1/8"-1/4" more then 3" OD so I had to stretch the sleeve around the end of the sensor assembly but with almost no effort it was on. Great! So far I've needed nothing but the 3" to 3" replacement air intake sleeve and the Honda intake tube kit. Now to assemble the entire thing. Ok. First, but not unexpected, problem. The tube is about 3" too long. Can't fit the air filter back on with everything assembled. Oops! :-) Out comes the hacksaw and a fine (24) tooth blade. Thankfully the air intake tube is aluminum. So, measure the length I need the tube to be and disassemble everything. Spend 10 minutes hacksawing the end off the intake tube and another 10 minutes cleaning up the cut edge. Reassemble everything. Great, it fits! Now, second, but still minor and not unexpected, problem. New bracket is garbage; couldn't hold up just the tube let alone the airflow sensor and that honk'n huge K&N filter. Pitch that into the scrap pile. Examine old K&N bracket. Mmmmm. Ya know, if I get a really big hammer and wack it one right there.....WACK!.....Perfect! The original air filter/mass airflow sensor assembly really doesn't fit much differently in the engine bay with or without the intake tube. My existing K&N bracket just needs to be moved from the right side of the sensor assembly to the engine (left) side of the sensor assembly and then moved forward to a different hole in the original Mitsu air box mount bracket attached to the fender. Make some minor alignment changes and tighten everything down. Last thing is splice the old PCV hose and new supplied hose together and slip the free end over the fitting on the new air intake tube. Beyond cool! Looks like it was made for it! Time? 8:30PM. Not bad! Test drive: HUGE increase in power? Sadly, no. This just does MORE to convince me that the primary problem with the Mitsubishi intake assembly (everything before the throttle body) is due to the stock air box where it mounts to the mass airflow sensor assembly. I believe the adapter plate used to mount the K&N filter to the Mitsubishi mass airflow sensor assembly is responsible for the lion's share of the performance improvement seen with K&N's FIPK kit. The Mitsubishi stock intake box basically just bolts to the sensor assembly with no provision for any shaping of the airflow into the sensor assembly. In my opinion, it's the shoddiest piece of design work on the entire vehicle. Any attempt to smooth that out there will surely improve airflow considerably and, hence, power. Would I still go through it again; was it worth $45? Yes! While not a HUGE increase in torque/HP the project was NOT a failure. The project did yield a noticeable improvement in usable torque from about 0-3,000RPM. 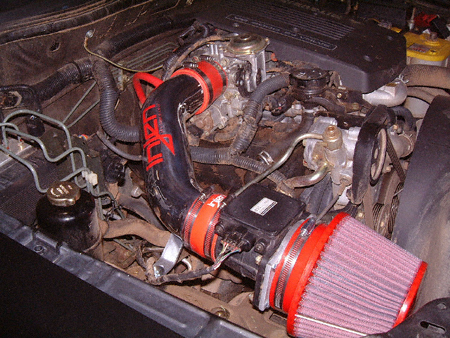 The most dramatic improvement was from idle to 2,500RPM. Not to say I now drive a Porche with 35" tires, but I shift about 1/2 as much in traffic which makes my clutch happier. I can accelerate in 3rd gear from 1300-1400RPM and in 4th from 2000RPM. Something I haven't been able to do for a while. Off road the difference noticeable. I can hold at 1000-1500RPM crawling over rocks with much less stalling and very steep inclines take about 500-700RPM less then previously. Like I said, definitely a torque increase at low speeds. On the down side, I've seen no change in gas milliage. Which could be good or bad, depending on how you look at it. :-) Hasn't seemed to go up or down. Stuff to do. I'd STILL like a better support bracket for the intake/tube assembly. Currently, its only one 'legged'. I'd like to add another leg and bolt that to another spot on the stock intake box fender bracket. AND, I want to get a longer PCV hose installed instead of the spliced assembly I jury-rigged on there. Nothing major, though.